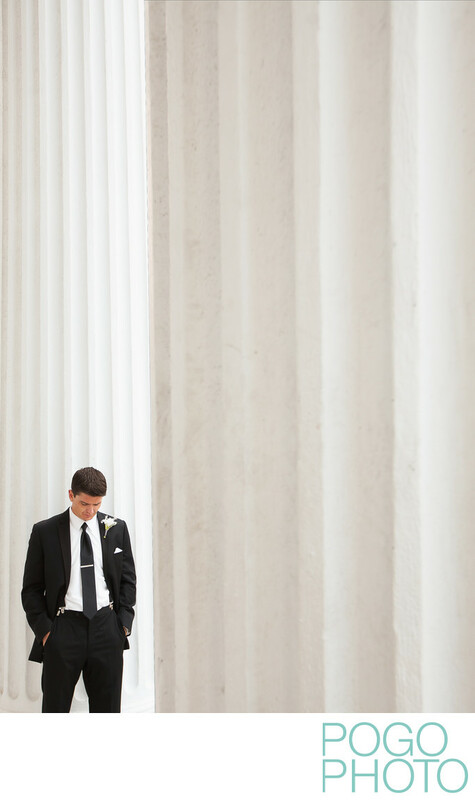 This groom is awaiting his bride for their first look, which was arranged on the portico of a building near their hotel in the charming southern city of Charleston, South Carolina, with towering white marble columns that made for a stunning graphical element to this apprehensive portraits. You can feel the worried anxiety of this groom as his bride approaches, waiting to see her for the first time all day. We love first looks partially because they simplify the day’s timeline, but mostly because they're a few fleeting private moments between the couple before they're pulled in a hundred directions the rest of the wedding day. Having a few minutes to exchange excited greetings, a few kisses, and a deep breath while you ready yourselves to walk down the aisle and into the rest of your lives together can be an immensely helpful part of the day. Being kept apart may seem like a sweet tradition, but when examined with a modern eye the historical reasons feel less romantic and more contractual. Many of our couples describe their soon-to-be-spouse as their “best friend”; we ask you to stop and think: why would you want to spend the whole day apart from your best friend? We’d even go so far as to suggest getting ready together if you feel like spending the entire day together would feel more natural. The people saying “you can’t” or “you must” may just be repeating what was told to them five, ten, or twenty years ago. Why must you? It’s your wedding day: do what you like. 1/400; f/4.0; ISO 200; 30.0 mm.